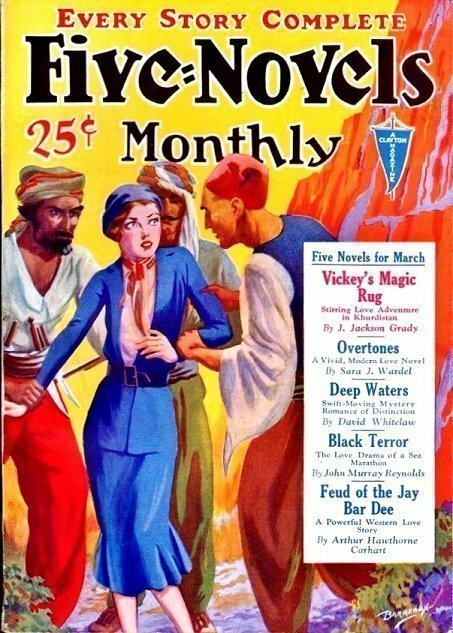 FictionMags Index shows the story “Vicky’s Magic Ring” by J. Jackson Grady, but the cover shows “Vickey’s Magic RUG”. 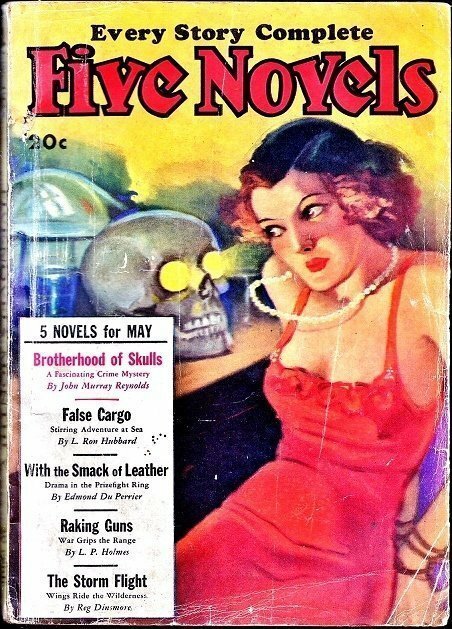 Grady only wrote 3 Pulp stories, all in FIVE-NOVELS MONTHLY. Bookery shows: “Uncommon” $8.00 – $20.00 – $40.00. $40.00 is for FN condition, so even if you wanted to double the price for a VFN copy that would be $80.00. The $175 selling price seems a bit high to me then. “Long running American pulp carrying a wide variety of fiction. This issue is notable for an early story by L. Ron Hubbard. The magazine is in good condition. Front cover lightly age soiled with some corner creasing plus light edge wear. Back cover also with some age soiling and light creasing. Spine complete with fully readable lettering. Both covers firmly attached. Interior pages in good condition with some small edge splits to a few pages. In my opinion, FIVE-NOVELS MONTHY consistently had some of the best cover images on Pulps between 1928 up to around the mid-1930’s.